Mention Bryan Matthews in the local handball scene and the name is no stranger. 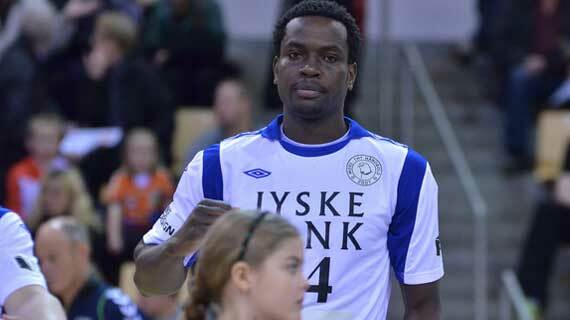 The Kenyan international plying his trade at Mors-Thy Handbol in the Danish Handball League has come against all odds to become one of the best handball players in the country. “ I played both handball and football but I had to pick one for advanced career and I chose handball’’. Before he left for Denmark, Bryan had stints with local clubs that include Umeme, his home club Black Mamba then East and Central Africa Club Champions, National Cereals and Produce Board handball team. On his experience in the Danish league, Bryan told Michezoafrika.com that the system and structures are way different from the way things are done back at home in Kenya. ‘’The tactics here change from time to time, so you really need to be on point to keep up’’.He said. Bryan has been called upon a number of times to represent the national team and his view on the performance of the team was that there is need for more exposure ‘’we need to play more international games not only the national team but also the clubs. The need for youth teams alongside the senior teams is also necessary’’. ‘’handball is a team sport and without my team mates I could not have achieved so much’’. Apart from handball, Bryan is also involved in other activities, he is a board member of the Life to the Lifeless Org ‘’ I want to give back home that is why I am involved in this organization’’. He is also Ambassador of Gloab town another Danish NGO. He further adds that the impact handball has had on his life is a dream come true ‘’ I thank God for the talent that he has given me and also how far he has brought me’’. His advice for the handball players back at home is putting God first and also hard work.